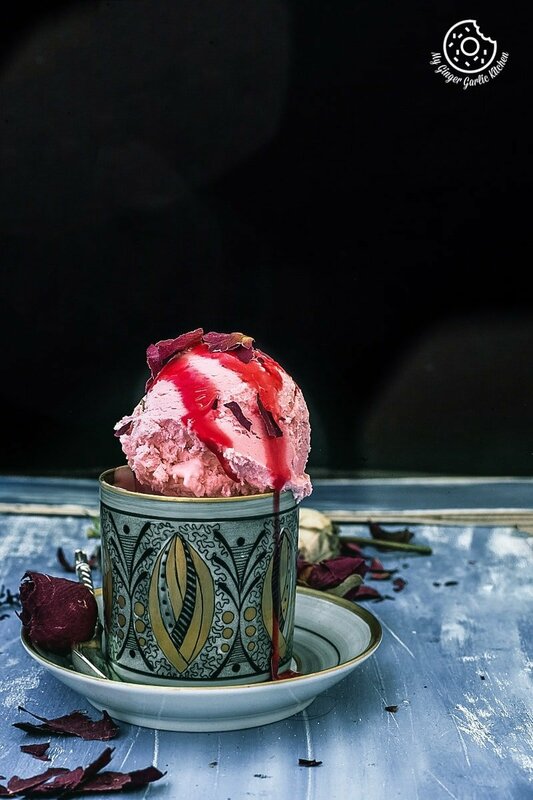 Learn How To Make No-Churn 3-Ingredient Rose Ice Cream Recipe | Rooh-Afza Ice Cream recipe with a video tutorial. 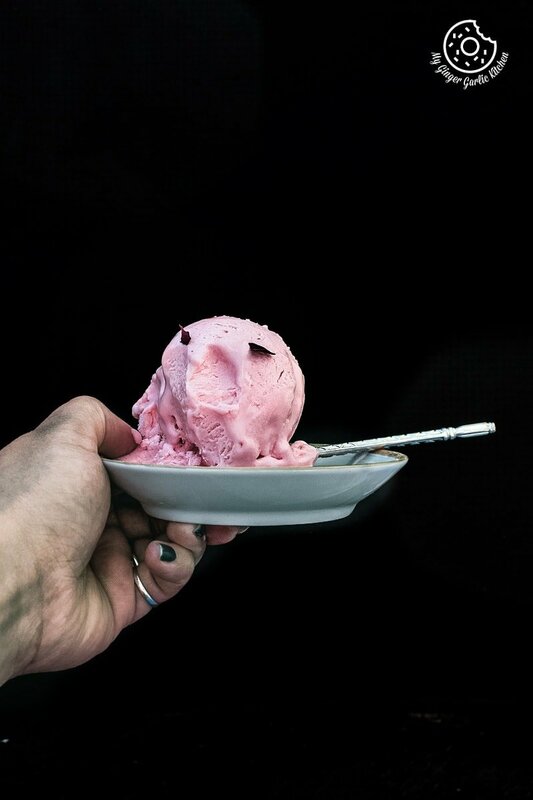 This rose ice cream is a smooth, rich, velvety and delicious treat which is so full of dreamy rose perfume. 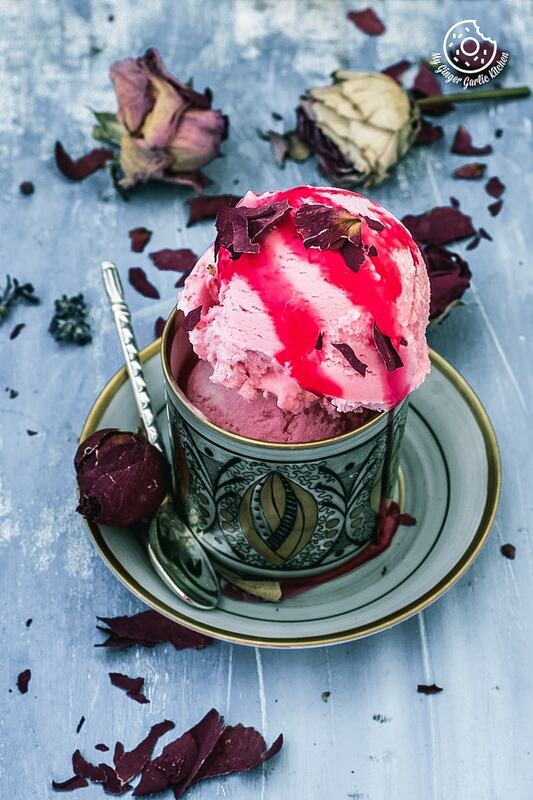 This delicately flavored Rooh-Afza ice cream is a simple but an exotic ice cream recipe that can easily be made without an ice cream maker. In terms of the weather, warm temperatures are still playing hide and seek here. One day is hot and the other day is really cold. But the good news is that the month of June is here which is officially the summer month. Hence, no matter what the weather shows, we are gonna treat it like the real hot summer. And summer demands something really delicious and chilling to cherish. So the first thing comes to my mind which fits into these criteria of chilling and enjoying is an ‘ice cream’. Who can say NO to an ice cream? Correct? Rose flavor is my childhood love. As most of you know that I grew up in India. The summer is really hot there. So people keep finding the newer and tastier ways of hydration to pass through the hot days. During my growing up years, the shops used to be flooded with so many flavored sugar syrups. Many of them were made to add into the water and we called them ‘Sherbet’. There were some syrups which could also be added to the milk. And last year, I found this exact ‘Rooh Afza’ bottle at an Asian grocery store. The moment I saw that bottle, all my childhood memories flashed back in front of my eyes. And without any single thought, I picked that bottle up. The same evening I made that rose milk for little ‘A’ and myself. And she was flattered by the color and flavor. You know girls like anything pink. 😉 And no wonder that full bottle was consumed within a month. We just love anything rose. And with the next bottle, I made this rose ice-cream which is my family’s favorite. So I thought I should share with you all this gem of an ice cream. 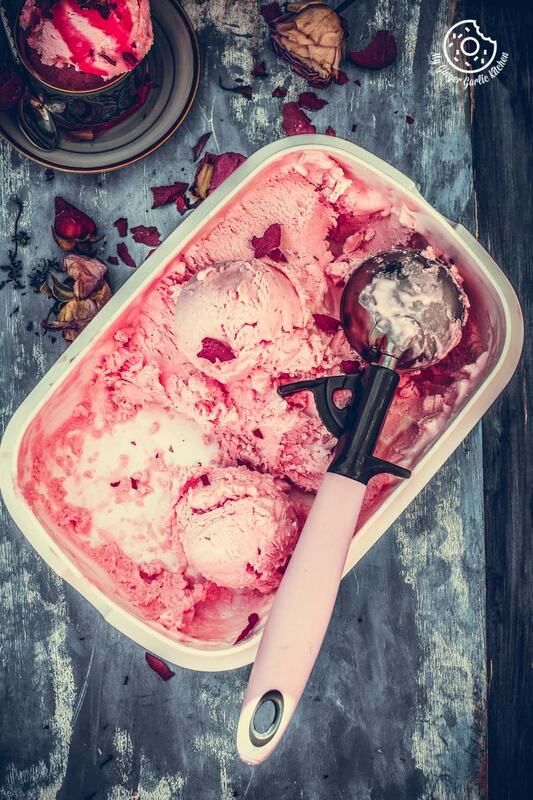 If you love rose flavored anything, then you would really love this ice cream. This No-Churn 3-Ingredient Rose Ice Cream is creamy, soft and velvety like a fragrant bunch of roses, and the good news is that it can easily be made without an ice-cream maker. You know I love the rose floral flavor. I have already told you about this when I shared the recipe of ‘Rose Masala Chai’. I just love this rose scented tea, and so I drink it often. 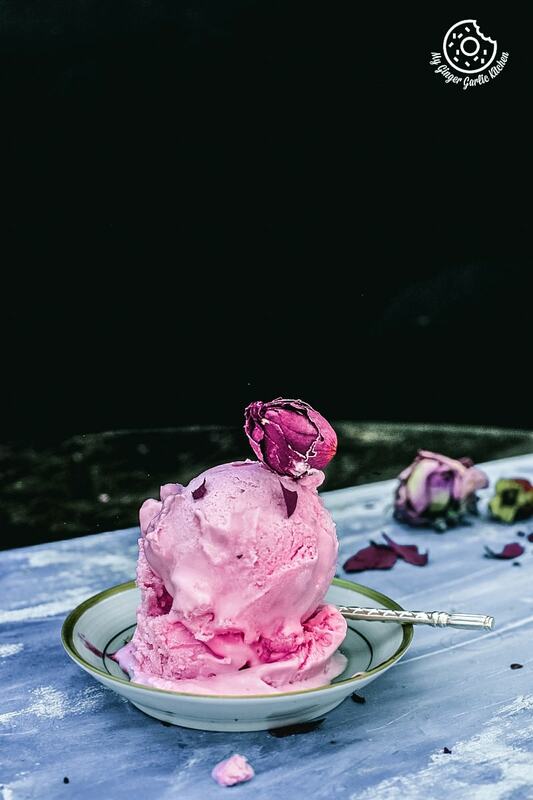 I love rose flavored things and this rose ice cream is a delicious treat which is so beautifully and delicately flavored with rose syrup. I also added little rose water for that intense rose flavor but that is completely optional. 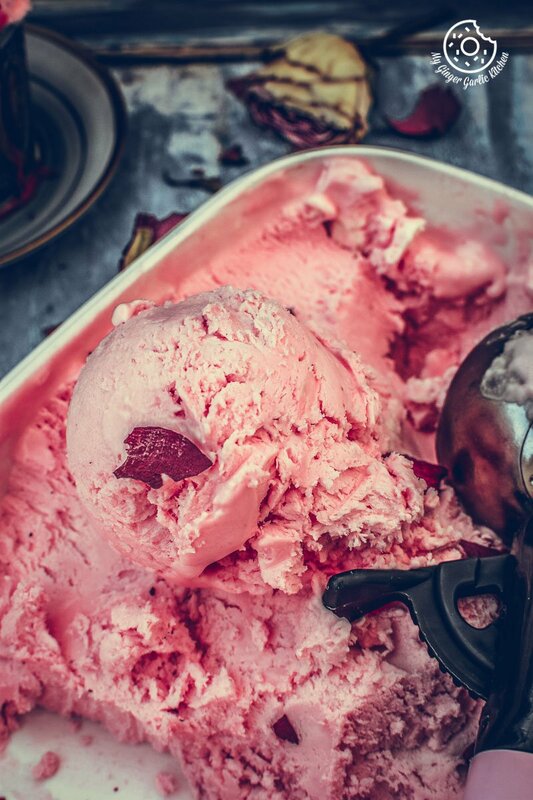 This smooth, rich, velvety rose ice cream is so full of dreamy rose perfume. This is a simple but an exotic ice cream recipe that can easily be made without an ice cream maker. 2. Add in the condensed milk and vanilla extract and whisk until combined. 3. Add rose syrup and rose water and stir well to combine. 4. Pour ice cream mixture into a freezer safe tin or container. 5. Sprinkle some dried rose petals. 6. Cover and place in the freezer for 6-­8 hours, or overnight. 7. Scoop out ice cream in a cup or cone. 8. Drizzle with some rose syrup, sprinkle rose petals and enjoy. You can also add chopped pistachio to this ice cream.